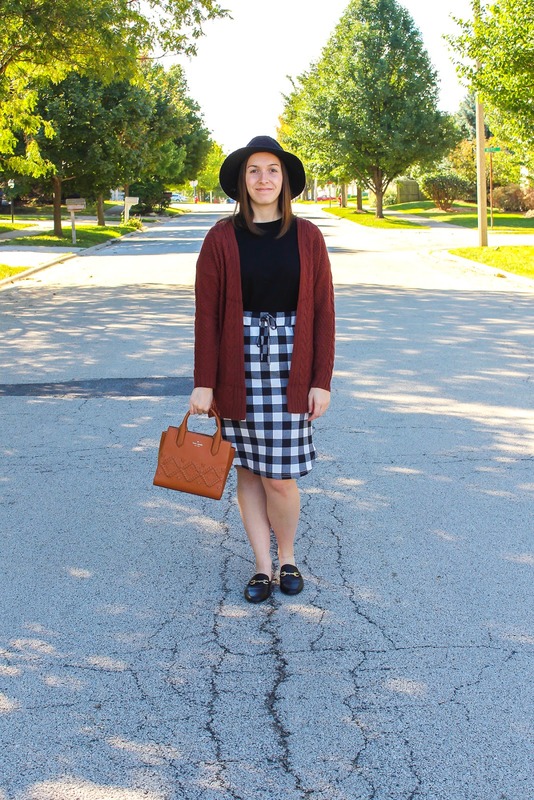 Today is the first post of many that will provide outfit inspiration for the fall season. Welcome to your stylebook. Much like a playbook, the stylebook is full of ideas and inspiration so you can put together some killer outfits this season. 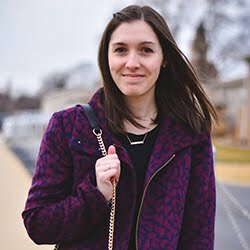 You can find all your stylebooks here on the blog whenever you're in a rut and need help styling a look, or if you need to find an item for your shopping list. 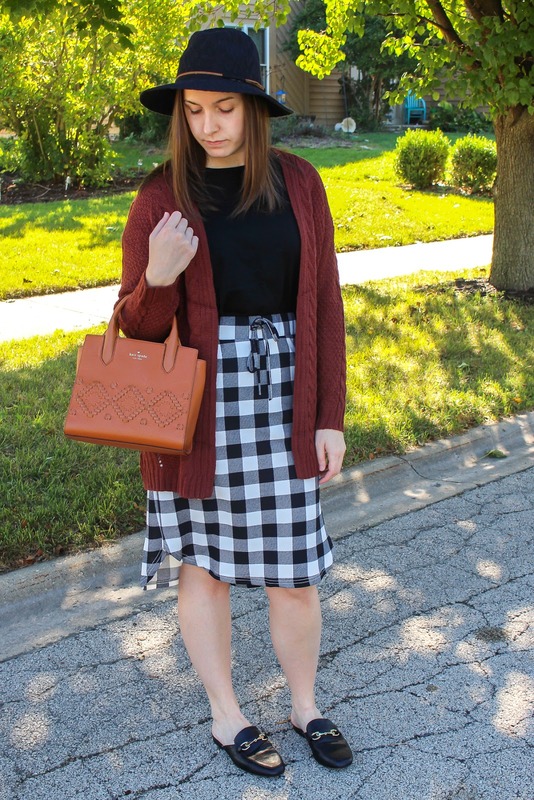 Plaid patterns are an OBVIOUS fall staple, so when I saw this black and white buffalo plaid skirt, I knew I could have so much fun with it. This is the weekend skirt from Tickled Teal- a super comfortable style with a tie waist and a slightly longer hem in the back. The material is stretchy and I love the simplicity of the silhouette. 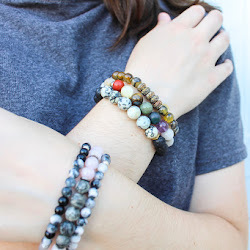 Plus, they're super affordable, costing less than $20. 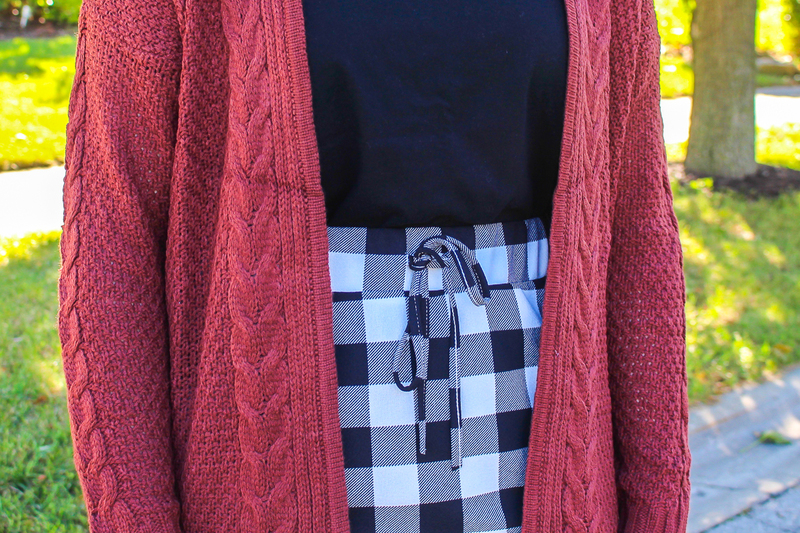 Although you can style this skirt many ways, for this look I chose to mix in some additional colors to really make it scream "fall." 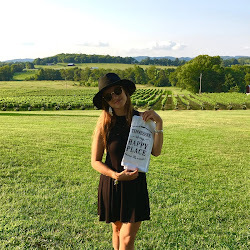 First things first, I tucked in a plain black cotton tee from Old Navy- a basic staple you can NEVER go wrong with. 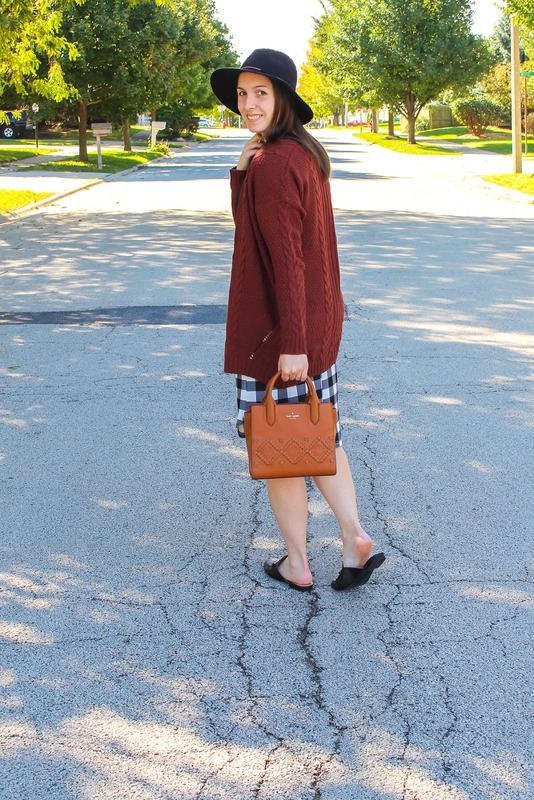 I then added on this deep orange sweater cardigan for a pop of fall color. The brand is Debut and I just picked it up this season from T.J. Maxx. 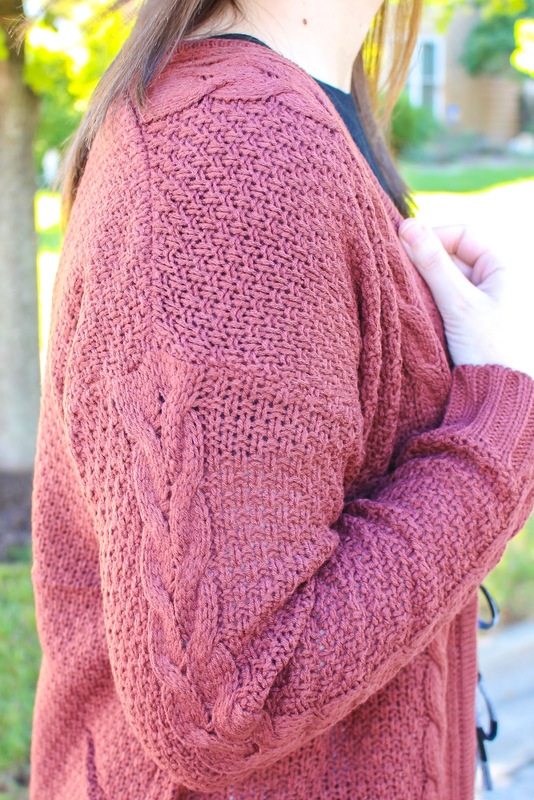 I love the unique knots and cutout details this sweater has, and the heavier material will be perfect when the weather starts to cool down. 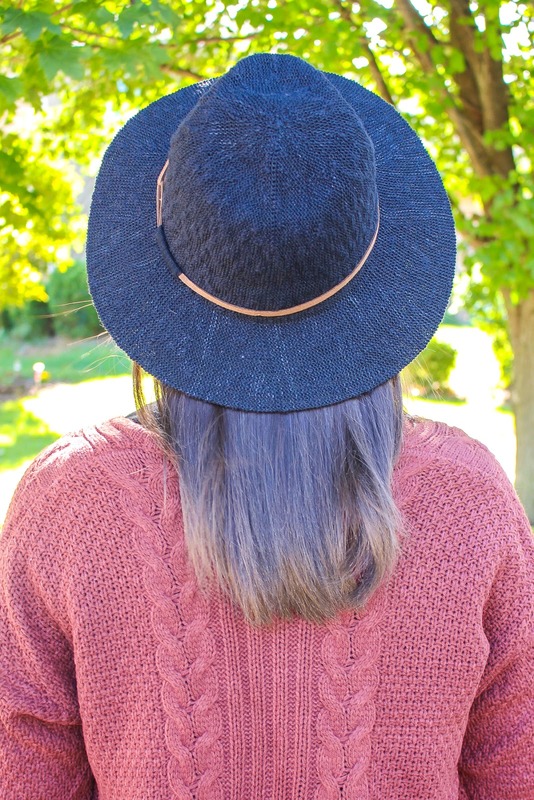 Having this color in your wardrobe for fall is a MUST. 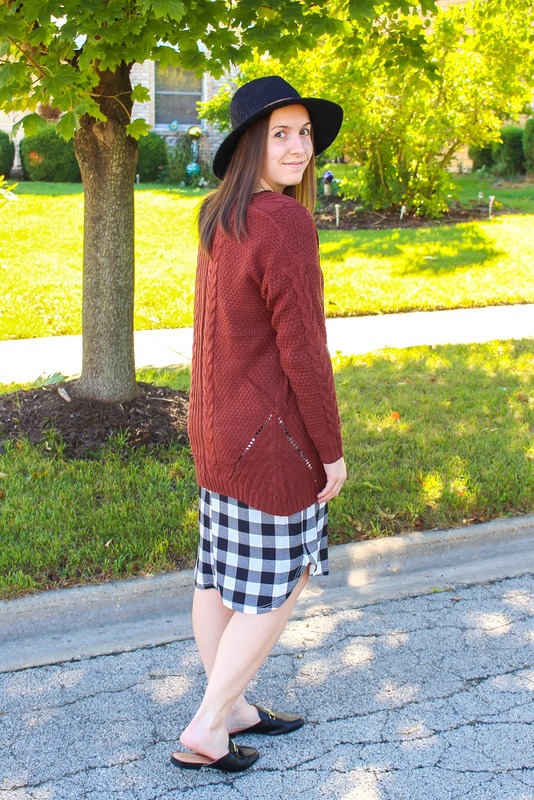 This outfit would pair perfectly with boots, but since it is still pretty warm here in Illinois, I opted for my black backless mules from Target instead. I really like how they are the perfect alternative to ankle boots this time of year. To accessorize, I decided to add on a black fedora hat from Kohls. 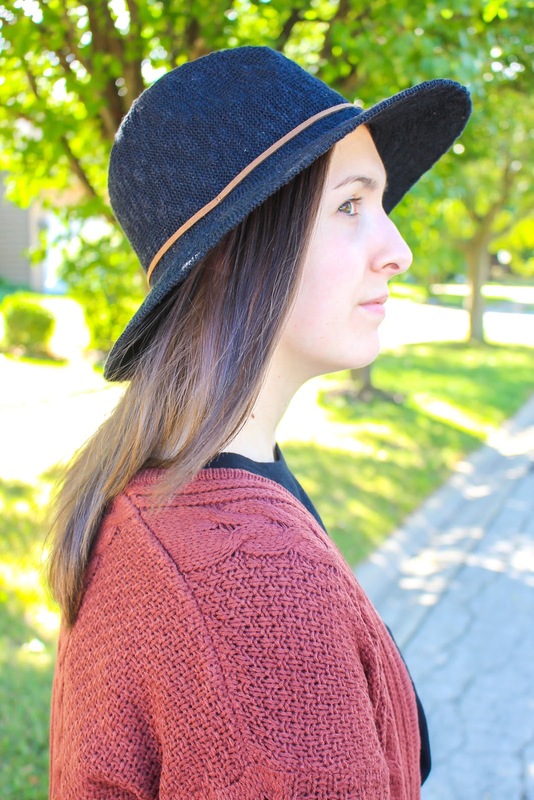 This style hat really comes out to play during the fall months and instead of detracting from the outfit, I think this piece complimented it perfectly. Finally, my camel-toned mini bag is Kate Spade and I recently thrifted it with the matching wallet for $95. 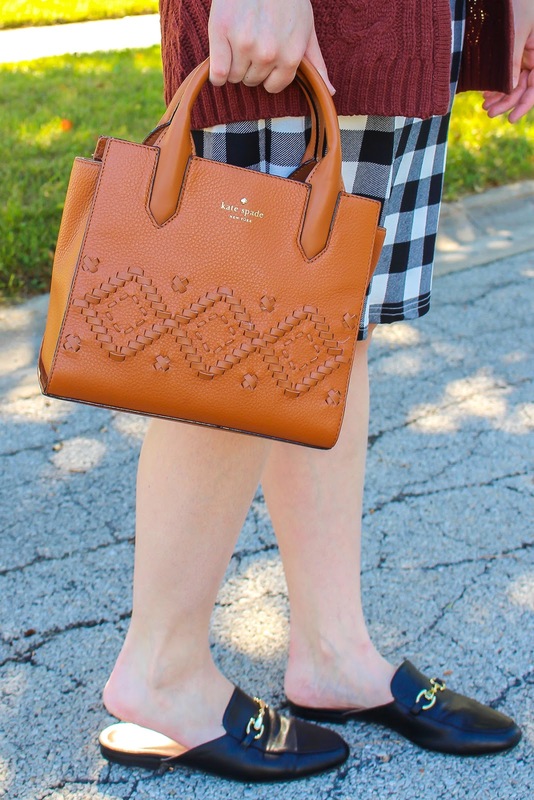 This is most definitely my fall IT bag- I'm obsessed with the weave detailing and that it is the perfect seasonal shade. 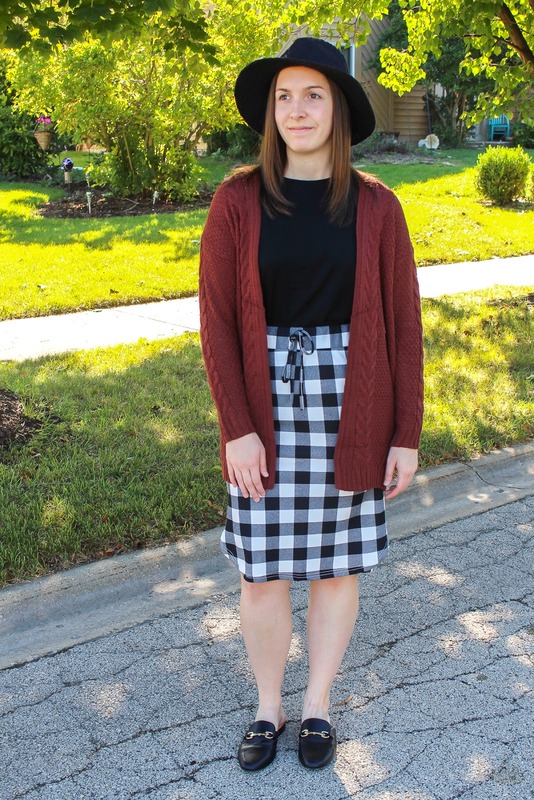 Although this is the only brown color in the look, all of the neutral tones play off each other well for the fall, not making the outfit too "color busy." I personally didn't add any jewelry, but a gold necklace and earrings would really stand out against this outfit. This is one of my favorite looks this season so far; the mix of colors and patterns creates a unique outfit inspired by the fall. It makes me want to grab a pumpkin spice latte IMMEDIATELY. How about you?